The Nashville Sounds got solo home runs from Jett Bandy and Willie Calhoun, and a solid start from Taylor Hearn in a 3-1 win over the Round Rock Express at Dell Diamond Tuesday night. Bandy extended the Sounds' lead immediately in the third when he launched a solo homer to deep left field to make it a 2-0 game. It was Bandy's first home run of the season and the fourth for Nashville. Hearn got off to a fast start by putting up zeroes in his first four frames. He avoided a problem in the fourth when he walked the bases loaded. He came back to get Alex De Goti to fly out to right field to end the threat and preserve the 2-0 lead. The Express finally got on the board in the fifth when Derek Fisher drilled an opposite-field solo homer to left-center to trim the deficit to 2-1. It stayed that way until the ninth inning as Hearn's relievers Brett Martin and Nick Gardewine were superb. Martin entered in the sixth and worked 2 1/3 shutout innings before giving way to Gardewine in the eighth. Nashville got an insurance run in the top of the ninth when Willie Calhoun lined a solo homer out to the berm in right field. Calhoun's first long ball of the season gave the Sounds a 3-1 lead. After escaping a jam in the bottom of the eighth, Gardewine allowed a leadoff single in the ninth but then cruised the rest of the way. He retired De Goti on a fly out then recorded back-to-back strikeouts of Garrett Stubbs and Myles Straw to hammer down his first save of the season. Hearn earned the first Triple-A win in his career. He allowed one run on four hits in five innings. The southpaw walked four and struck out four. Game two of the three-game series is scheduled for Wednesday night in Round Rock. Right-hander Ariel Jurado (1-0, 1.80) starts for Nashville against right-hander Brady Rodgers (0-0, 0.00) for Round Rock. First pitch is scheduled for 7:05 p.m.
- With tonight's win, the Sounds improved to 4-2 on the season. 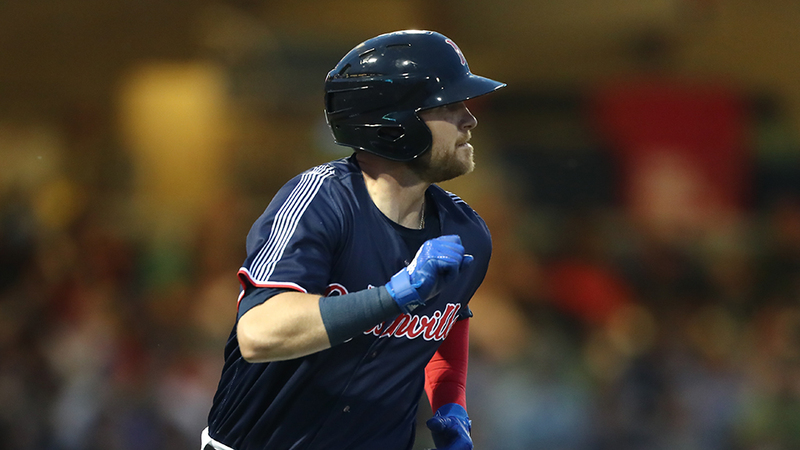 - The two home runs hit by Nashville (Jett Bandy & Willie Calhoun) is a season-high. - Nick Gardewine earned his first save of the season and 17th in his career. - When Calhoun homer in the ninth extended his on-base streak to six games.